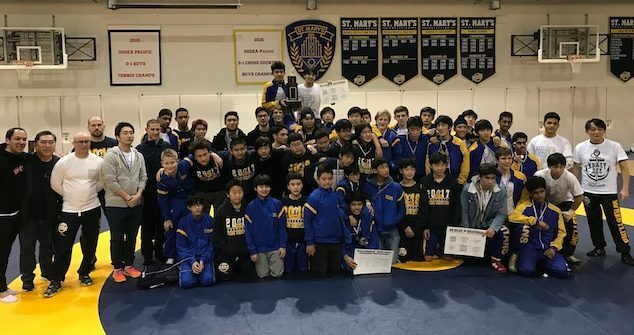 For the first time since the inception of the middle school wrestling program, St. Mary’s hosted the MS Tournament along with the Kanto JV and Varsity Tournaments. The result: a full gym to cheer on all our wrestlers, High School wrestlers coaching and cheering on the Middle School grapplers, Middle School Titans having an opportunity to watch and cheer on their High School Senpai , the greatest group of parent volunteers any sports program could ask for and, of course, a bunch of medals won by the boys! Weight Division 3A pool – this was an all-Titan bracket with Co-Captain Warren Koslow, Shogo Kuramochi and Michael Patton going head-to-head-to-head. When the dust settled, Warren took gold winning both of his matches by pin. Michael took Silver and Shogo Bronze. Weight Division 5A pool – a single Titan, Isaac Shane, stood against three ASIJ and one Yokota wrestler. Isaac dropped his first match and then battled back to even his record by pinning his opponent in the second match. IN the battle of Isaac’s that was match three, he got himself into some trouble and lost to eventual gold medal winner, Issac Garcia. Motivated by the second loss, Isaac came out strong in his final match and won by pin! In a tough bracket, Isaac settled for Bronze. Weight Division 5B bracket – As in the 5A bracket, it was one Titan v. the world! May Sonoda wrestled hard winning one of his three matches by pin. This bracket turned into a battle between ASIJ and Yokota and May settled at 4th place when the dust settled. Weight Division 5C pool – Two of our newest wrestlers, 6th graders Kai Sandoval and Robin Haller were thrown in to the Lion’s Mustang’s Den and feel victim to their ASIJ opponents who dominated this pool. Finishing 4th and 5th, respectively, Kai and Robin showed a lot of heart and potential to grow in this sport. 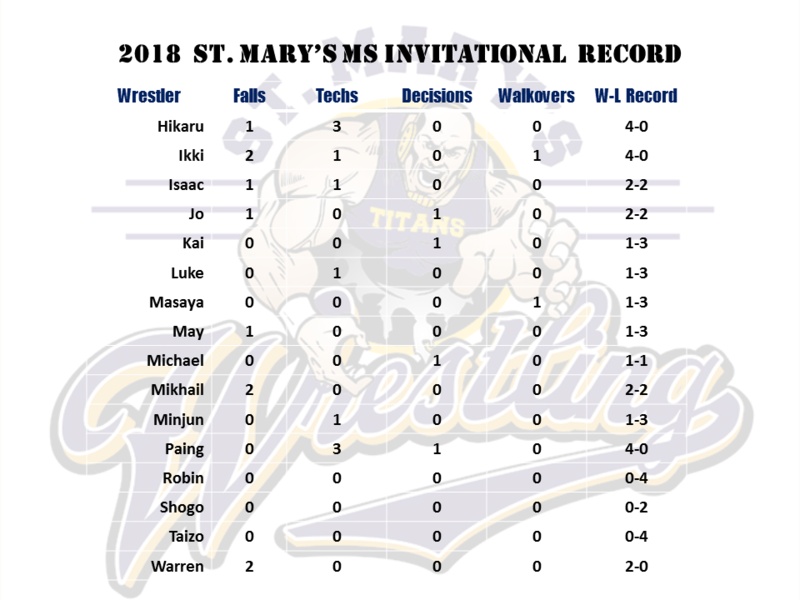 Weight Division 5D pool – 8th grader Mikhail Titov faced a wave of black and gold and the Titan single handily tried to tame the mustangs in a pool where every other wrestler wore an ASIJ singlet. After starting off strong and winning his first two matches by pin, Mikhail struggled against the eventual gold medal winner in his third match and then lost a close decision in his final match landing him in 3rd place. Weight Division 5E pool – 7th grader Minjun Kim faltered a bit in his first two matches and then came back in his third match to win by tech fall. His last match was to determine 3rd place as Minjun went into the match with 5 points and his ASIJ opponent with 4. Unfortunately, this one went to ASIJ and Minjun had to settle for 4th place. Weight Division 5F pool – Two Titans went up against three Mustangs. Ikki Minamikawa won all of his matches and amassed 19 total points, enough to beat out his ASIJ opponent for gold. Teammate, Masaya Toyokawa, lost a close decision in his 4th match and that ended up being just enough for his ASIJ opponent to come out on top with Masaya settling for 4th place. Weight Division 5G pool – Paing Phyoe was the sole Titan in this pool which came down to head-to-head win criteria to determine the winner. Paing finished with 15 points as did his ASIJ opponent but since Paing had beaten his opponent by decision, the gold was his! Weight Division 5H pool – Co-Captain Hikaru Shimada was joined in this pool by teammate Taizo Harada. Taizo had a rough day and ended up taking 5th place but Hikaru managed to win all of his matches by either tech fall or pin and his 17 total points were enough for gold! Weight Division 5I pool – Titans Jo Andrew Inoue and Luke Robottom had their share of tough matches in this pool. The two 8th graders showed the determination and basic skills they’ll need to be successful in high school refusing to go down without a fight. In the end, Jo took 3rd place with 10 total points and Luke 4th place with 6 points.